This time, we feature 2018 restaurant startup costs, fast food vs. fitness Google searches, Thanksgiving's Halo Effect and lots of food and beverage trends for 2019. Headlines continue to be encouraging for the industry, as chain restaurants posted their fifth consecutive month of positive same-store sales growth during October. This month’s sales growth rate of 0.8 percent does represent a slowdown from the 1.2 percent reported for September and the 1.8 percent for August, but there was a promising sign in October’s results. Same-store sales growth on a two-year basis was 1.1 percent during October. As a comparison, two-year sales growth rates averaged -0.9 percent for the previous six months. These insights come from TDn2K’s Black Box Intelligence™ data, based on weekly sales from over 30,000+ locations representing 170+ brands and nearly $71 billion in annual sales. Although positive sales growth is welcome news for restaurants, the way this growth was achieved during October tempers optimism in the strength of the industry by putting a spotlight on its problems. Same-store guest traffic was -2.2 percent in October, a 0.8 percentage point drop from the growth rate recorded for September. Furthermore, it was the weakest month for traffic growth since May. Positive sales growth was widespread across most industry segments in October. All segments except for family dining achieved positive same-store sales growth. The best performing segments based on sales growth were fast casual and casual dining. Both had growth rates above 1.0 percent in October. After having struggled through the last two years, these segments have emerged in 2018 as the most improved in terms of same-store sales performance. In fact they are the only segments with positive sales growth during each of the last five months. Much discussion has centered around the viability of casual dining in this changing consumer landscape. However, the data shows some brands in the second largest segment within the industry have been able to turn the segment around this year. Over the last two years, restaurant operators have been citing staffing and employee retention among the biggest concerns they face. After a small relief from turnover rates that appeared to be stabilizing in recent months, turnover increased again during September for restaurant hourly employees and restaurant managers. Additionally, restaurants need to keep up with replacing those employees that leave. TDn2K’s People Report data shows the number of jobs in chain restaurants grew by 1.7 percent during September, after a year-over-year growth of 2.1 percent during the previous month. According to People Report’s Q3 Workforce Index, 58 percent of restaurant companies plan to add hourly workers during the fourth quarter, while 51 percent said they plan to add management staff. Not surprisingly given the environment, the latest People Report Workforce Index also revealed that about 70 percent of restaurant companies reported an increase in their staffing difficulties for both restaurant hourly employees and managers. As the labor market experiences its lowest unemployment rates in almost fifty years, restaurants should be expecting rising labor costs ahead. With plenty of employment opportunities in the market, restaurant employees (particularly in management and back of the house) frequently mention pay among the main reasons they are quitting their jobs. Higher wages and salaries will have to be a part of many restaurants’ employment offerings if they are to remain competitive in the market. In a time when so many issues divide Americans, a group of consumers that crosses generations and demographics is shaping the future of food. A new report released by FleishmanHillard at The Culinary Institute of America's reThink Food conference shows, when it comes to food and nutrition, an emergence of shared beliefs and behaviors among Gen Z, Millennials, Gen X and Boomers. 91 percent say food is an important part of their values and belief system. 35 percent say that food defines them. 79 percent feel it's their role and responsibility to share food information with others. 81 percent believe they can make a difference in the kinds of foods we eat and how they are grown. 78 percent have taken action to address food issues important to them – with reducing food waste emerging as their top priority. 60 percent say they bear the responsibility for improving what and how we eat – more than food companies, government entities or health professionals. Research from digital ordering technology provider Preoday and mobile payments and loyalty marketing platform Yoyo has found that value and speed are critical to delivering a successful workplace canteen experience, and that technology can help meet this demand. When asked what is important during their lunch break, a third of workers with a workplace canteen (32 percent) say cheap prices and value for money is critical when buying food from their workplace canteen. Currently a similar proportion (28 percent) don’t believe they are getting enough value for money – nor are they being rewarded in any way for their regular custom at workplace canteens. Over half of UK workers (57 percent) said the introduction of tech-led loyalty schemes that could offer more personalised deals would lead them to visit their workplace canteen more often. At present, only 15 percent of workplace canteens provide any sort of loyalty scheme to office workers. Yoyo CEO Michael Rolph said that tech-led loyalty schemes can also put the right customer data into the hands of workplace caterers and open up a whole new world of personalisation. “Usually the closest lunch spots in proximity, workplace canteens have a duty to deliver an experience that will maximise both value and convenience for time-poor workers taking lunch. When asked, almost a third (27 percent) of workers say “speed” is one of the two most important factors when considering their lunch options – and nearly a quarter (24 percent) said that queuing time actively puts them off visiting their workplace canteen. Two fifths of UK workers (40 percent) also say they would visit their workplace canteen more often if the service was quicker or they could pre order their food and pick it up without queuing at all. However, at the moment, only 17 percent of workplace canteens offer a pre-ordering functionality to customers. This report from Preoday and Yoyo reflects the anonymised responses of 2,003 workers based in the UK with a workplace canteen, surveyed between 12th – 19th September 2018. The survey was conducted by Opinium. RestaurantOwner.com released the report of their 2018 Cost to Open a Restaurant Survey. The report summarizes input gathered from over 350 independent restaurant owners and operators regarding their startup costs as well as their financial performance. The median size of restaurant startups was 3,070 square feet, and 120 seats. This size resulted in a median of 31 square feet per seat. Kitchens occupied about 31 percent of the restaurant space, with a median size of 1,000 square feet. The median annual sales across all service types was $1.125 million. That financial performance resulted in a median annual revenue of $325 per square foot, or $10,567 per seat. Median time to profitability was 5 months. 25 percent of owners reported that their restaurant was profitable within the first 2 months and another 25 percent took 12 months to become profitable. The median net income reported was 5.5 percent. Despite expanded third-party delivery options like Postmates, QSRs continue to lead in brand loyalty, according to a new study by social media research firm Fizziology. To explain the current atmosphere among consumers and QSRs Fizziology completed a comprehensive report analyzing candid social posts on the topic of QSRs and delivery apps to explain the space. When it comes to quick service restaurants and delivery, consumers want to share their experiences with ordering and beyond on social media, showing how much these brands are part of their everyday lifestyles. Through analyzing millions of consumer opinions across social platforms, Fizziology was able to identify emerging trends impacting quick service restaurants and delivery apps. As dining experiences continue to evolve it’s important for leaders in the restaurant space to adapt to the changes. Fizziology analyzed Chick-fil-A, McDonald’s, Taco Bell and Wendy’s drive-thru and delivery conversation in September 2018. The QSRs are included in the top 10 fastest drive-thrus (QSR Magazine 4), but also offer delivery through third-party apps. Conversation surrounding a drive-thru was seen 102 percent more than delivery mentions. McDonald’s was the only brand to have more delivery mentions, which was due to its strong partnership with UberEats. Chick-fil-A’s drive-thru drove 611 percent more mentions than delivery. Expanding delivery and catering is the QSR’s priority as its locations have six or more cars crowding the lane 40 percent of the time (QSR Magazine 5). While other brands are creating additional lanes and new digital menu boards, Chick-fil-A is piloting a new type of store entirely. Chick-fil-A’s new concept hyper-focuses on delivery and doesn’t offer a drive-thru or dining room. As to-go orders grow in popularity, QSRs can strategize and implement concepts that may have been unconventional in the past. While QSRs need to refine and master the drive-thru experience, it’s important to also elevate delivery services to compete with QSRs like McDonald’s and Chick-fil-A that are leading in the space. With National Fast Food Day on (November 16, Digital Third Coast wanted to see if Americans were more likely to search for fast food or fitness keywords. To do this, they analyzed 2018 Google search data to identify the states most obsessed with fast food and the states most likely to make healthy choices with their diet. Betty Crocker is a CPG brand consumers have relied on to build out their Thanksgiving menus for decades. However, even though Betty Crocker has been historically linked to the holiday, data reveals they are far from the only CPG brand benefiting from the food shopping lead-up to Thanksgiving. Captify, the global search intelligence company, pulled this data. Data reveals that Betty Crocker’s lead in Thanksgiving has created a halo effect for competing CPG brands. From October 1 – November 8, searches for Campbells increased by 197 percent and searches for Kraft increased by 165 percent. As anticipated, searches for Betty Crocker increased by 4973 percent during this same timeframe. Low and behold – the facts show that Betty Crocker’s lead in Thanksgiving food shopping creates a moment for the Campbells and the Krafts of the industry to capitalize around the holiday, and in turn, reach consumers. Retail sales in October increased 0.4 percent over September on a seasonally adjusted basis and were up 5.6 percent year-over-year unadjusted, according to calculations released today by the National Retail Federation. The numbers exclude automobiles, gasoline stations and restaurants. Three years after the switch to new chip-based credit and debit cards, a study released today by the National Retail Federation and Forrester says payment card fraud is still a top concern for large U.S. retailers as criminals move their activities online. “In a post-EMV world, fraud is shifting from in-person to ecommerce channels, so retailers have been busy bolstering their defenses to mitigate the increasing costs and risks of ecommerce fraud,” the NRF/Forrester report said. To help fight fraud, the report found that retailers want better authentication of purchases no matter where they take place and that 33 percent have implemented 3-D Secure, a system marketed as Verified by Visa or MasterCard SecureCode that is intended to help authenticate online purchases. For in-person purchases, 51 percent of merchants said biometrics would be the best way to verify transactions, and 53 percent expressed interest in implementing forms such as the fingerprint and facial recognition available on smartphones. But with that technology limited to phones rather than cards, 46 percent said personal identification numbers would be the best currently available way to approve card transactions. For purchases made with cards, 95 percent of retailers said requiring PINs would improve security and 92 percent would implement it if it were available. While EMV cards in other countries are chip-and-PIN, virtually all EMV credit cards issued by U.S. banks have been chip-and-signature with PIN available only on debit cards. And the major credit card companies stopped requiring a signature last year. NRF has long argued that PIN is important because the chip in EMV cards only prevents the use of counterfeit cards while not stopping lost or stolen cards, and a PIN can also provide a backup for cases where the chip malfunctions or is tampered with. In addition to the focus on cards, retailers have also been installing technology to fight data breaches and thereby keep criminals from stealing card data that can then be used to commit fraud. The report found 89 percent expect to have tokenization in place by the end of next year, and that 80 percent plan to do the same with point-to-point encryption. The second-biggest concern was the cost of accepting payment cards, including the swipe fees banks charge to process transactions, cited by 45 percent. While the survey found 49 percent of retailers have taken advantage of routing options required as part of a cap on debit card swipe fees passed by Congress in 2010, rising swipe fees for credit cards remain the subject of litigation between retailers and the card industry. Chargebacks of disputed purchases, which increased after implementation of EMV for some retailers, were the third-biggest concern, cited by 35 percent. TSYS conducted a study to understand how consumers feel about the payment technologies they encounter at restaurants. Of particular interest is a finding that one in five consumers have had a slow payment process incident ruin a dining experience. In fact, this is the most common payment experience to ruin a dining occasion. In its 6th annual Culinary Trends report, the Sterling-Rice Group (SRG), a research leader on trends in the food industry, identifies the top culinary trends that will stand out on menus, expand into grocery shelves and attract consumer interest in the year ahead. The report identifies flavors, ingredients and even technological advancements in Artificial Intelligence and farming as components of the wave of dining and eating influences. It also cites a growing interest in food as a health, wellness and beauty partner. SRG's Culinary Trends Report for 2019 here was overseen by the agency's culinary director Liz Moskow and its culinary team who drew insights from over 175 food experts, sociologists, chefs, nutritionists, and other trend-spotters. "The thread that ties all the new flavors, ingredients and market forces together is how our desire to improve all aspects of the human experience is profoundly influencing the foods we will be eating well into 2019," explains Liz Moskow, Culinary Director at SRG. "We are also seeing extreme diet protocols from keto to paleo and more, giving consumers permission to eat things that were previously considered bad for you. This gives full fat dairy and other foods a seat at the table." Butter is the New Bacon – Fat Bombs are the new antidote to hunger and ketosis. And butter now appears on restaurant menus at an all-time high of 64 percent. Bitter is the New Sweet – Sugar aversion has given rise to bitter as the flavor of choice – menu references to bitter have risen more than 22 percent in the past four years and are projected to grow over 18 percent in the next four. Lettuce is going beyond the salad bowl and into fresh-pressed juice with exotic new varieties and hydroponically grown lettuces being called out by name on menus. Rooted and Ravishing – The plant-based revolution has taken hold with diners hungry for hearty veggie-centric main dish options with vegetables like cassava, Japanese yams, parsnips, jicama and even the classic white potato served up in delightful new forms. Data Mining Dining – Artificial Intelligence is the hot dish being served up in the food industry now. Technology is being leveraged to foresee food and flavor trends happening in real-time. Tech companies like Spoonshot, Foodpairing, Analytical Flavor Systems, and FlavorWiki are employing machine learning to support new product and menu development to pinpoint ever-changing consumer preferences as they happen. "SRG has built its business on helping our clients leverage changing food and dining trends to bring fresh new offerings to their consumers," explained Cindy Judge, CEO of SRG. "With insights like these to help guide our innovation process, we have been able to deliver over $10 billion in new revenue to our clients over the past five years." Targeting increasingly adventurous consumers, set on new discoveries and experiences, will be key to developments in the food and beverage industry in 2019. The connected world has led consumers of all ages to become more knowledgeable of other cultures, contributing to 35 percent growth of "discovery" claims, when comparing 2017 and 2016 new product launch numbers. "Discovery: The Adventurous Consumer" leads the list of Innova Market Insights' Top Ten Trends for 2019. The company continuously analyzes global developments in food and beverage launch activity and consumer research to highlight the trends most likely to impact the industry over the coming year and beyond. For most consumers, snacking is a part of daily life and always has been. What is changing, however, is the way people think about snacking and what is considered a snack. Snacking is no longer the optional extra, but the definitive occasion. It is a central focus of innovation across all food and beverage categories, with 10 percent average annual growth of global food and beverage launches with a snacking claim over the past five years (CAGR 2013-2017). Plant-based foods, cannabis, and an ice cream renaissance top the list of 2019 trend predictions from the Specialty Food Association's Trendspotter Panel. Taking in influences from Millennials and Gen Z, and the often-overlooked Gen X, 2019 is setting up to be a year that takes the specialty food industry to new heights. "The specialty food industry is growing rapidly, and much of this can be attributed to innovations happening in areas like sustainability, the plant-based movement, and desire for deeper regional flavors," said Denise Purcell, head of content for the Specialty Food Association. "The Trendspotters are seeing major shifts in how consumers are eating. These shifts are providing us with amazing options, along with the opportunity to change how we eat and how food is created. Old favorites like ice cream are being reinvented, while at the same time, we're seeing foods and flavors from around the world increasingly adapted into our everyday meals. It's an exciting time for specialty food, and we expect to see even more growth and innovation throughout 2019." The movement will become situated in the larger context of sustainability : intertwined with upcycled products, as more companies turn to root-to-stem ingredients to combat food waste; snacks made from rescued bananas, or flours made with spent grains or pulp. In addition to continuing product rollouts in snacks, and as dairy and protein alternatives, plant-based foods' rise across the foodservice sector will be significant in 2019. Palates shift to regional cuisines of Africa, South Asia, and Latin America—driven by Millennials and Gen Z . Much has been said about younger generations' unprecedented exposure to global culture and cuisine from an early age. These consumers are adventurous and seek experience in their travel and in their food, which has led to a shift in interest to authentic regional fare. Cannabis across multiple categories . 2018 saw the emerging edibles segment gain a foothold in snacks and treats, as more states legalize sales of hemp-derived CBD products. Though the segment has its challenges as cannabis is still illegal at a federal level, consumer curiosity has been piqued. Factor in that a new generation is growing up in states where cannabis is legal, and signs point to future growth of the edibles market. Look for more infused cooking oils, coffees, teas, chocolates, baked goods, snacks, and even beer and pasta to hit the market in the coming year . Packaging takes center stage—in the environment, and in consumer communication. Soliciting consumer trust through values conveyed on product packaging and, in some cases, the material of which it's made, will be more visible in the coming year. 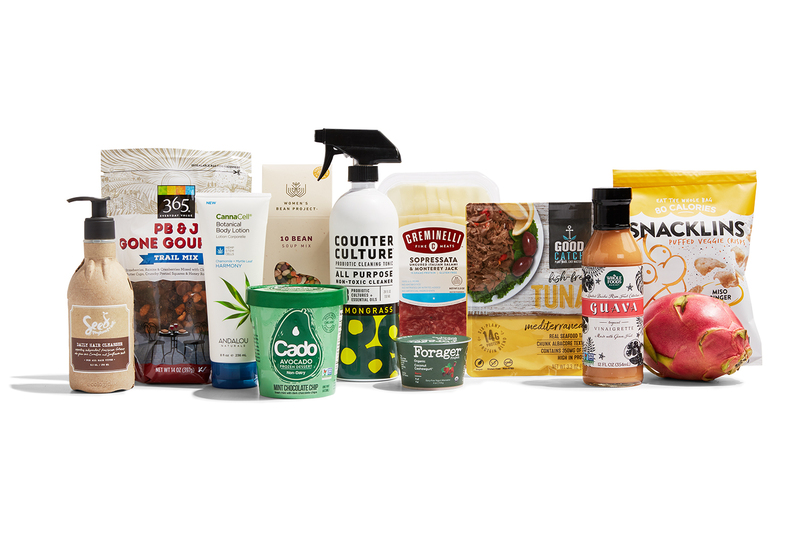 As consumers increasingly placea premium on company values, producers are making their certifications and accreditations, such as B Corp, women-certified, and animal welfare, more prominent on packaging. Fermented functional beverages . Refrigerated ready to drink (RTD) functional beverages have grown 20 percent in retail sales, according to SFA's State of the Specialty Food Industry research. Probiotic-friendly kombucha has led the charge, and more fermented functional beverages touting health, tradition, and flavor are on the horizon. Look for mushroom brews highlighting varieties like chaga, a nutrient-dense mushroom linked with antioxidants and cholesterol-lowering benefits; lion's mane, reported to have anxiety-reducing and heart-health benefits; and cordyceps, which may help with anti-aging as well as diabetes prevention and heart health. Edible beauty . Noted as emerging by last year's Trendspotter panel, collagen is a full-fledged trend in 2019, and part of a bigger move to develop products that promote skin health and appearance. Collagen is being infused into beverages, snack bars, and even wraps to help replace diminishing levels as consumers age. Traditionally used topically, argan and almond oils are coming to market. Both oils are high in omega fatty acids and vitamin E which can help hydrate skin, restore elasticity, and reduce the visibility of wrinkles. 8. Ice cream renaissance . We all scream for ice cream, and now this traditional favorite is being rethought in function and flavor. Its reinvention started with dairy-free varieties made with coconut, almond, or soy milks. Then Halo Top entered the scene with its high-protein, low-calorie product that others are emulating. Now makers are blurring the lines between treat and healthy snack even further with some blending vegetables like cauliflower and carrots by into ice creams. It's not all about health—boutique creameries known for local, hand-crafted, and indulgent ices creams are expanding nationally. Flavor inspiration from the Pacific Rim (think Asia, Oceania and the western coasts of North and South America) are popping up in grocery stores and restaurants as people continue to explore more of the world through their palates. Ingredients like longganisa (a Filipino pork sausage), dried shrimp, cuttlefish and shrimp paste are on restaurant and home menus that span from breakfast to dinner, while vibrant tropical fruits such as guava, dragon fruit and passionfruit are making their way into colorful smoothie bowls and cocktails. Jackfruit is a popular meat alternative already being used in place of items like barbecue pulled pork, while an extract of monk fruit, an ultra-sweet-tasting fruit also known as luo han guo, can be used as a sweetener replacing added sugars. In the coming year, Whole Foods Market and 365 Everyday Value brands will launch a limited collection of refreshingly sweet products inspired by Pacific Rim fruits like guava tropical vinaigrette, pineapple passionfruit sparkling mineral water, mango pudding mix and passionfruit coconut frozen fruit bars. Back in 2017, our experts predicted the naturally occurring probiotics in fermented foods like kimchi and “pickled everything” would blow up the food world. In 2019, expect even more innovative probiotic integrations in food — and not just in the supplement or refrigerated aisles. New strains of probiotics such as Bacillus coagulans GBI-30 and Bacillus coagulans MTCC 5856 are making more shelf-stable applications possible. Wellness-focused brands are making it easier to get more probiotics in your day by adding functional probiotic ingredients to your pantry staples through products like granola, oatmeal, nut butters, soups and nutrition bars. Another unexpected place shoppers can find probiotics is in the cleaning aisle with brands like Counter Culture Probiotic Cleaning Tonic, an all-purpose cleaner that utilizes probiotic cultures and essential oils. Even beauty brands are including pre- and probiotic-based ingredients through sunscreen and other topical body care. Eating more plants doesn’t mean you have to forgo beloved meaty flavors and textures. Plant-based foods will continue to surprise and inspire — this year taking on the meat-based snacking world of jerkies and pork rinds you may associate with the corner store and road trips. While plant-based foods aren’t exactly a new trend, our experts noted more people — even those who don’t eat only vegan or vegetarian — are exploring plant-based snacking as their palates crave adventure, want a break from meat or seek more ways to add savory umami flavors into snacks and meals. Mushrooms like king trumpet will play a key role here, flexing their flavor and texture powers in tasty jerky, “pork” rinds and “bacon” snacks (used in both Pig Øut Pigless Bacon Chips and Snacklins Cracklins Without the Pork) to offer up a satisfying crunch. Beyond these reinvented veggies and plant-based products, vegetarians can indulge in Quevos Egg White Chips for even more snacking. While there is something comforting and classic about a scoop of vanilla ice cream, some consumers are wanting something a little less, well, vanilla. The new pints on the block are adding a fresh take on a timeless treat with innovative bases like avocado, hummus, tahini and coconut water. Look down specialty frozen aisles and you might find plant-based frozen desserts like CocoWhip Soft Serve and ice creams with savory swirls of artisanal cheese (and don’t think you’ll stop seeing those low calorie, high protein players in the frozen aisle anytime soon). Globally-inspired frozen desserts are taking the stage — possibly sparked by 2018’s mochi ice cream obsession and a Thai rolled ice cream craze — with icy indulgences like airy Taiwanese snow ice and Mexican nieves de garrafa, not to mention stretchy, chewy, Turkish ice creams that get their unique texture from mastic and other unique sources. Popsicles and gelatos won’t be left out of the fun — they’ll get some buzz with boozier infusions coming to market. Seaweed snacks rose to popularity a few years back and are now enjoyed by health-conscious adults and toddlers alike, however, our experts expect even more ocean influence in the grocery aisles in the year to come. Think beyond seaweed snacks. Sea greens are showing up in dishes like seaweed butter and kelp noodles while consumers are exploring new depths of ocean flavors with superfood properties like unique varietals of algae and kelp. Puffed snacks made from water lily seeds, plant-based tuna alternatives with algae ingredients, crispy snackable salmon skins with omega-3s and kelp jerkies are just a few testing the waters. A salty sea fennel and olive blend will debut on Whole Foods Market olive bars in 2019, and brands like Ocean’s Halo include kelp as an ingredient in all their miso and ramen broths, condiments and sauces. Snacking across the board will take a turn toward the fancy, and snacks, as they start to usurp the usual three-meals-a-day routine, are anything but ordinary. Snacking has become an occasion of its very own — think charcuterie or cheese boards for one, one-ounce portions of Cypress Grove cheeses paired with demi-baguettes as desk snacks and more mini meals. More takes on snacking nod to the comforting treats of your second grade lunchbox, with better ingredients. Portable snack packages will feature bites like prosciutto and aged mozzarella, and artisanal versions of classic snacks like cheese or peanut butter cracker sandwiches. Ingredient-conscious snack and treat makers are creating new packaged snacks that take us back to our treat-loving childhoods but with higher quality ingredients, some of which are updated to accommodate special diets. Upgraded retro treats will star on 2019’s shelves — candy-coated Project 7 Organic Chewies burst with intense fruit flavor and are gluten free; Smashmallow’s marshmallow and puffed rice treats are gluten free and made with organic sugar; Little Secrets Crispy Wafers are long crunchy rectangles dipped in fair trade chocolate. Much like last year’s Transparency 2.0 trend, consumer purchasing power continues to motivate changes in the food, beverage and body care industries, as shoppers expect more from the brands and businesses they choose to support. In 2019, thoughtful consideration behind purchases moves beyond (but doesn’t exclude!) environmental stewardship and animal welfare, and becomes more people-focused. Greyston Bakery practices an open hiring model — no questions asked — to practice what they call “radical inclusion,” which includes anyone who has faced barriers to employment. Kuli Kuli produces moringa powder which is often grown and processed by women, and has provided more than $1.5 million in income to women-led farming cooperatives, nonprofits and family farmers around the world through their organic moringa supply chain. Whole Planet Foundation partners with suppliers such as Chobani, Frontier Co-op, Naked Juice, Wallaby Organic, Papyrus-Recycled Greetings and more to alleviate poverty through microcredit loans for the world’s poorest people — mostly women — who become empowered microentrepreneurs lifting themselves and their families out of poverty. Media outlets like Cherry Bombe Magazine make it easy to find and support women-owned businesses and female chefs in your community, while inspiring discussions on how to move the industry forward together. Contributing toward social movements via purchasing goods and services with missions you believe in can make for big changes that extend far beyond the world of retail. This year’s predictions came from Whole Foods Market’s culinary experts and industry leaders who source items and lead trend-spotting initiatives across the retailer’s more than 490 stores. The in-house specialists combine their expertise from all departments including cheese, specialty, grocery, meat, seafood, prepared foods, produce and body care, when preparing the forward-looking trends report. Mintel, the world’s leading market intelligence agency, has today (15 November 2018) announced three forward-looking trends which will lead the momentum of global food and drink innovation in 2019 and beyond. The future of cannabis in the food and beverage industries will be worth billions, according to the latest report from FUTURES – the new insights service from just-food and just-drinks. Earlier this month, Michigan became the latest US state to give recreational cannabis use the greenlight, while Canada is expected to welcome cannabis food and drink products next year. Outside of North America, the drug is gaining acceptance and support. The latest free report from FUTURES offers a detailed look at who the key players will be, where consumers will come from and what food and drinks companies need to do now to stay ahead in this nascent category. FUTURES editor Lucy Britner said: "Several large companies have already invested heavily in the cannabis space. The versatility of the drug means it will have far-reaching consumer appeal – and it will impact food and drink. "This is the second in a series of future insights reports, designed to look at what will disrupt the food and drinks industries and offer insight into what businesses can start to do now." FUTURES was launched in October 2018 by just-food & just-drinks' parent company Aroq. Starting with a series of digital magazines, the FUTURES service covers everything from new technologies to emerging consumer trends. The first edition was concerned with the growth of autonomous grocery delivery and how it is likely to impact the food and drinks industries. Wine.com announced the twelfth annual Wine.com 100. Reflecting the top wines purchased on the website during the first 10 months of 2018, the Wine.com 100 is the industry's only list based exclusively on consumer purchasing behavior. With nearly 35,000 unique vintage-specific wines purchased at Wine.com in 2018, the Top 100 is an exclusive group representing the best-selling available labels. The list provides insight into consumers' online wine-buying patterns, highlighting popular producers, regions and varietals. The complete 2018 Wine.com 100 list is available online here. Washington State shines: This year, Substance 2016 Cabernet Sauvignon from Washington Statetopped our list. The list featured six Washington wines (up from 4 last year), two of which were in the top 10. This highlights the growing awareness of the state's value and quality combination, especially for red wine lovers. Consistent quality vintage over vintage. This year 10 wines gained two spots on the list due to a vintage change. From Chardonnay to Rose to Cabernet, wineries like Caymus and Kendall-Jackson made double placements, reflecting the consumer's loyalty to specific wine year over year. Rose all day. Following the national trend, rose claimed two more spots this year with a grand total of five. While not dominating the list, 5 percent is a big jump from the solo placement we saw in 2012. "It goes without saying that I am super excited about Substance Cabernet being the number one wine at Wine.com this year," says Charles Smith, owner and winemaker. "Wine.com has done a great job of bringing forth Substance Cabernet Sauvignon so that the consumer can find out the great value and great quality the wine offers. I make it for you, I hope you like it." "Our incredible assortment leads to customer discovery, from everyday wines to cellar-worthy collectibles. Offering wines from nearly every growing region on earth, our customers are able to explore the massive world of wine through our site," said Michael Osborn, Wine.com Founder and Executive Vice President. "With our unique Live Chat Sommelier Service, available 7 days/week, we provide real people with real wine knowledge to assist customers in navigating the vast selection and discovering the perfect wine for their needs." Thanksgiving means turkey time for millions of Americans. The vast majority (88 percent) of Americans surveyed by the National Turkey Federation eat turkey on Thanksgiving. But make no mistake, turkey is no mere one holiday wonder. For instance, turkey is also a popular main course during Christmas and Easter celebrations. Even beyond the holidays and special occasions, turkey has begun to take flight during everyday meals for many Americans, according to market research firm Packaged Facts in the report, Meat & Poultry: U.S. Retail Market Trends & Opportunities. Packaged Facts estimates total retail dollar sales of the U.S. meat and poultry market at $95 billion. With sales of $27 billion, poultry—including chicken, turkey, duck, geese, and quail—accounts for 28 percent of the market. Between 2011 and 2016 sales of turkey products in the U.S. meat and poultry market had a compound annual growth rate (CAGR) of almost 8 percent. "We've seen an uptick in turkey consumption volume as consumers increasing choose this product as a lean white meat alternative to chicken for non-holiday meals," says David Sprinkle, research director for Packaged Facts. " Strong retail sales growth of turkey products is occurring amid a premiumization trend for refrigerated and frozen products, driven in part by the growing popularity of heritage, natural, and organic turkeys. Another factor supporting consumption growth is the increasing availability of turkey-based products that mimic their beef- or pork-based counterparts, such as turkey bacon, turkey burgers, and turkey sausages. Amid health warnings over the risks associated with red meats many consumers sought poultry-based versions of these foods, and turkey is generally more amenable to processing than chicken. The value-added nature of processed turkey products contributed to dollar sales growth. Consumers expect ads to be relevant, according to a new survey by Clinch, a creative technology company that powers dynamic, personalized video advertising. The survey, which garnered insights from more than 500 U.S. consumers, found that 64 percent are comfortable with brands collecting some form of data – from demographic to social media profile information –to deliver a more relevant, personalized ad experience. Although the technology is available for brands to leverage data to reach consumers in more personalized ways, many brands aren't tapping into this capability. When asked if consumers feel that ads on social media are personalized or tailored for them, less than a third (31 percent) said that ads are tailored to them the majority of the time (75 percent of the time or more). In addition, 35 percent indicated that they see the same ad too many times, a sign that brands aren't using the data being collected to their full advantage. "Not recognizing the power of personalization is a big misstep among marketers," said Oz Etzioni, CEO, Clinch. "The data, creative tools and technology are available. Brands need to commit to building personalization-first strategies to create more meaningful consumer connections." With rich consumer data and pioneering ad tools, it's no surprise that social media platforms are an effective personalization advertising channel. Etzioni explains, "Personalization needs to be pervasive across platforms and ad units. Unifying data and creative to create holistic campaigns is critical as consumers move through their digital lives consuming all different types of content throughout their day." When it comes to social media, well-executed campaigns are increasingly driving direct sales. According to the survey, 70 percent of consumers have purchased a product or service after seeing an ad on social media. In fact, more than half (57 percent) purchased something in the past 12 months and, of those consumers, 60 percent have purchased between two and five products as a result of social media ads. However, purchasing a product isn't the only action that consumers can take. After being exposed to an ad, 80 percent of consumers reported that they have used a search engine to find the product, and 61 percent indicated that they have visited a physical store location. Etzioni concluded, "While there is no question that social ads are powerful, marketers must amp up their creative strategy. An effective social media video shouldn't feel like an ad at all. It should be personalized to the viewer and create an experience, rather than just deliver a sales message. Brands who follow this approach will not only see a direct sales lift, but they will also see increases in search and in-store traffic, as well." Global market research company Euromonitor International released today a new study, “Five Most Promising Markets in Coffee”, identifying opportunities in both under-exploited and mature coffee markets. The new research provides a global overview of the coffee market and identifies Brazil, USA, Indonesia, Germany and Japan as the five markets with greatest potential. Angelica Salado, senior analyst at Euromonitor International, commented, “companies sometimes wrongly believe that mature markets no longer offer opportunities for new players. However, coffee can present excellent opportunities for innovation in different channels, formats and claims, even in mature markets”. Download a free extract of the study here. So say respondents in the fourth annual Coast Packing Company/Ipsos Animal Fats Study, examining openness to, and consumption of, animal fats. Among the findings in this latest iteration of the consumer surveyfrom Ipsos Research and Coast, the number one supplier of animal fat shortenings in the Western United States: consumers recognize that not all fats are created equal or play an identical role in a balanced diet.